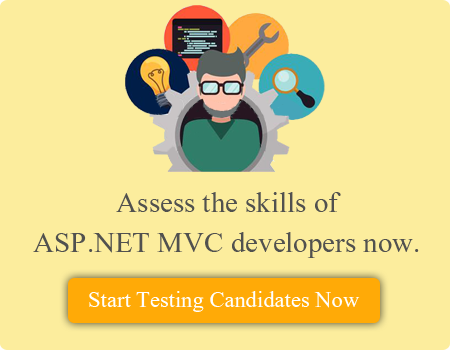 Why a recruiter should check ASP.NET MVC skills of Candidates before hiring? Is your technical selection team rejecting too many candidates for C# developer position??? Last week, you scheduled interviews of few candidates for C# developer position. But alas, technical team rejected all of the candidates saying they do not have application knowledge of MVC!! Have you encountered such a scenario as a recruiter? If yes, then let me help you quickly understand why this happened. A modern recruiter should have a basic understanding of the trends in technology. Interview Mocha leader of online recruitment tests has come up with a blog that will help you gauge the knowledge of MVC from hiring point of view. MVC (Model View Controller) is the most popular ASP.NET programming models. The View is the part of the application that handles the display of the data. The Controller is the part of the application that handles user interaction. Why it is necessary for a DOT NET developer to know MVC? ASP.NET MVC enforces separation of concerns. So there are very fewer chances of getting things more complex. The MVC separation helps you manage complex applications because you can focus on one aspect a time. Reduces the page size and there is an improvement in performance. It makes it easier to test an application. Enables the full control over the rendered HTML. Hope you are convinced by now that it's a fair demand by a hiring manager to test MVC skills of a candidate. I know you can't only rely on a resume :-( resume do not validate skills. No worries, we are at your rescue - check out our online test on ASP.NET MVC skills now. Interview Mocha's specialized online test on MVC contains well balanced and meaningful questions on C# .Net, MVC Architecture, Razor view engine, routing and filtering, bundling and minification to judge knowledge level of the test taker.